We are going to set up your radio in Centova Cast. After ordering a radio plan with us you will receive the login details for your server. 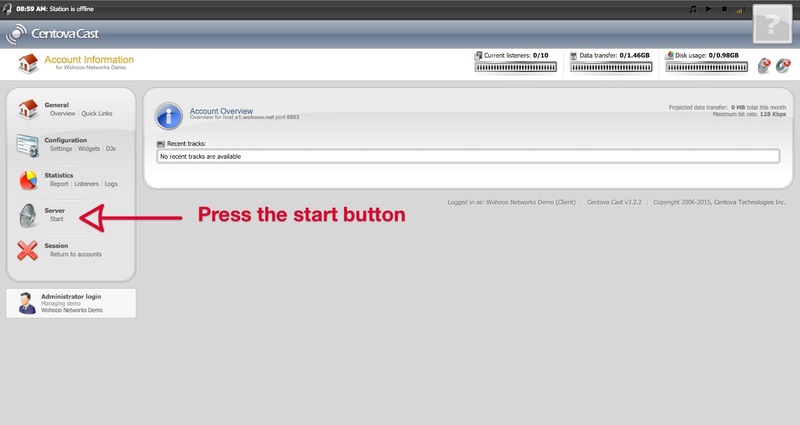 Go to the host address given in the email and enter your login details. Once in you will be inside your radio dashboard. To do this, just press the "START" button under Server in the left panel. After this, a message will be displayed telling that your stream has successfully started. Now start your encoder in your radio software and you can now broadcast live. To set up your radio with AutoDj, make sure your server is turn off as we will need to activate the AutoDj feature first. 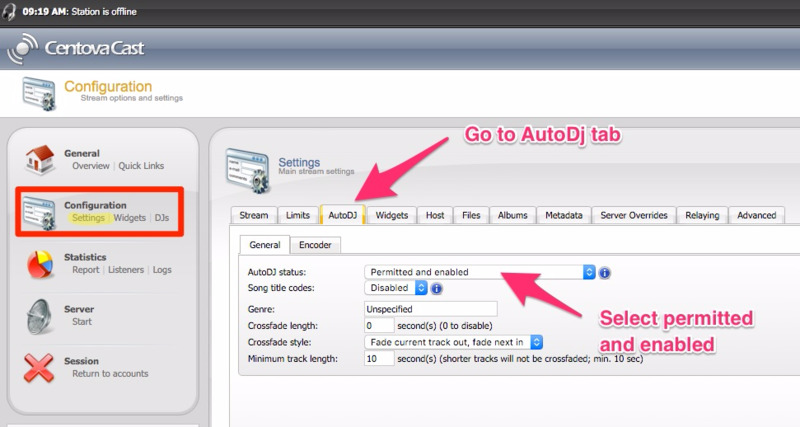 To enable the AutoDj, go to Configuration - > Settings on the left panel. Go to the "AutoDj" tab and on AutoDj status select " Permitted and enabled"
Click on the update button to save your settings. 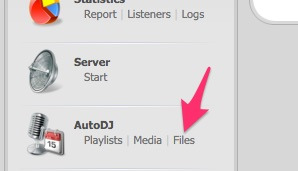 Now that we have AutoDj activated we need to upload our content to the media library and schedule our playlist. 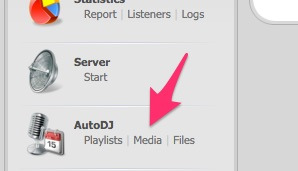 There is the Autodj section which is now enabled in the left panel. Go to AutoDj and click on "Files"
Then this window will bring up. 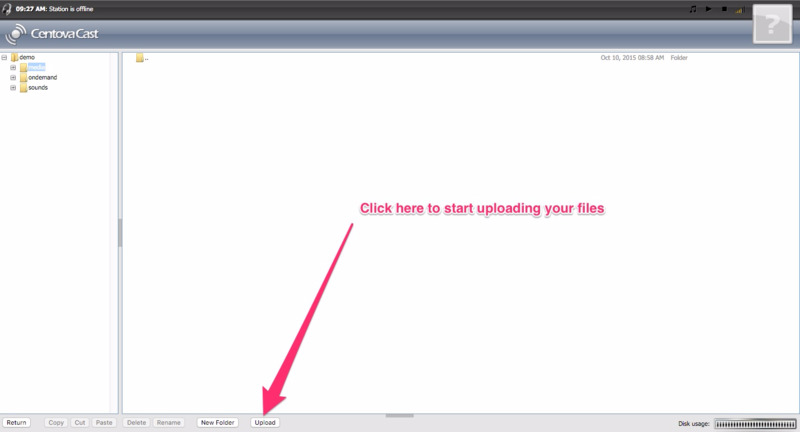 Click on the "upload" button at the bottom to start uploading your media files. 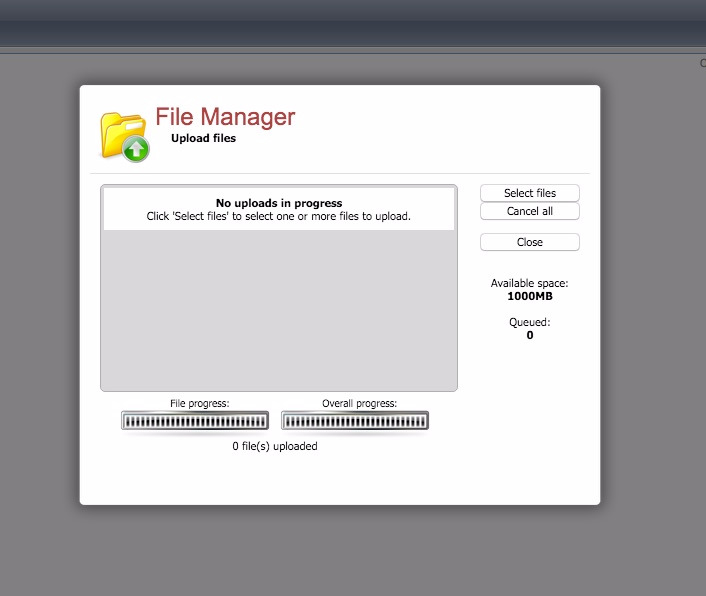 Choose your files by clicking on the " Select Files" button and begin the upload. After the upload is completed you will notice that the file is now in the media folder. We need to schedule the tracks in a playlist in order for the AutoDj to play. For this press on the "Return" button below. You will be brought back to the main dashboard. This time click on the "Media" link. 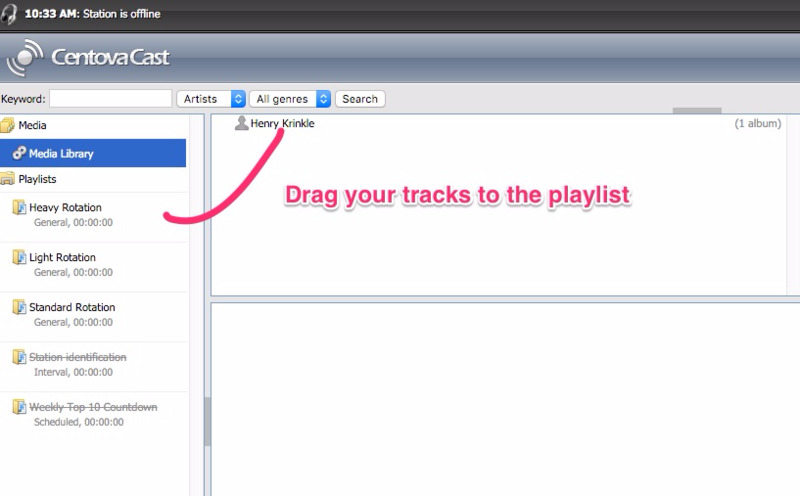 Inside the media page, you will be able to move your specific tracks to the appropriate playlist. You can consult the Centova guide attached to this documentation for more details on how to set your playlist. Now move your tracks to the playlist by dragging the media file to the playlist folder. Here we are using the heavy rotation to run all the tracks 24/24 without any time specification. You can always create your playlist for specific time slots. After you finish moving all your tracks to the playlist press on the "Return" link at the bottom to go back to the main dashboard. 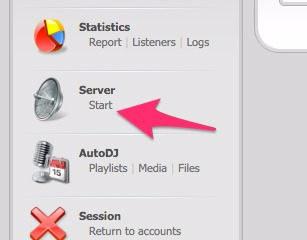 To start the AutoDj just press "Start" under server in the left panel. And here you go! Your radio station is up and running! You can go to the "Quick Links" Menu to get all the streaming URL or to "Widget" to get your embed code for your player and other plugins.